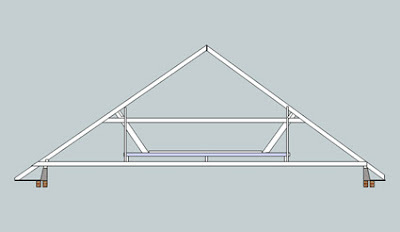 The most taxing mission yet (mentally at least) has been gathering the measurements necessary to arrive at the above sketch of the main roof trusses. It looks so simple now it's done, but gave me major headaches as every time I tried to draw it in Sketchup major bits refused to meet where they should. Unsurprisingly the bulk of the problems were my fault, usually not notating my on-site sketches clearly enough, thinking I'd measured from one point when in fact I'd measured from another. The same issue applied when translating the measurements on the computer, starting a distance guide from the wrong point etc. After a few trips back and forth from the bungalow I got it sorted, and was able to email the crucial info to Kuba (our designer). 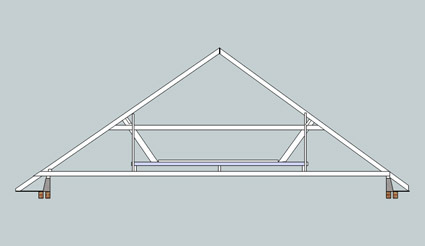 The purlins in the sketch (long chunky timbers running the length of the roof to support the rafters - barely visible on the skethch as they're end on) still don't sit quite where they should, but I blame that on the impossibility of using perfectly straight lines to represent a fifty-year-old timber structure. This was taken inside the eaves, above the soffit board. 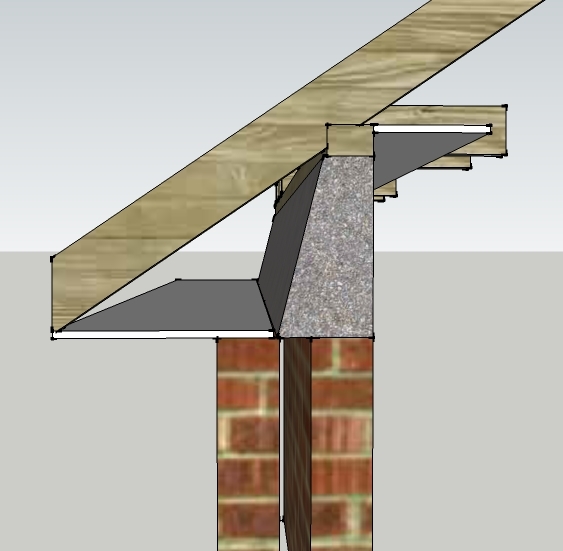 The big concrete beam sits on top of the inside leaf of the cavity wall and supports the roof, also closing the top of the cavity. I was surprised to find this (and had to remove some plaster from the inside wall just to confirm what it was) as I'd previously thought the whole bungalow would be built like the bit that sticks out at the front. 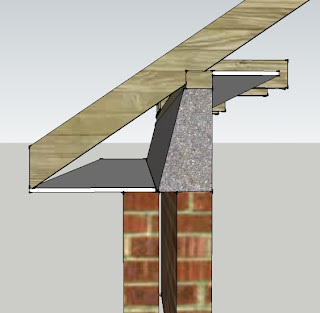 I'd already had a look at the cavity wall top here and found it to be completely open, with the inside leaf continuing to roof level in brick. It's a good job I did check the construction of the main walls. All this info will be invaluable to us and Kuba for ensuring any structural changes are sound, and to make sure we design insulation accordingly. Before we build the new bale walls, that cavity will be filled (probably with glass-fibre granules made from recycled glass); once we've built the straw walls that gap in the eaves above the soffit board will also have to be filled somehow (likely with cellulose fibre insulation or sheep-wool insulation).